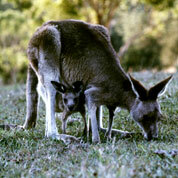 Reproductive success in eastern grey kangaroos is high with a short green grazing lawn. These are of high quality and often floristically diverse and not indicative of ‘over’ grazing. The Code of Practice says joeys can be ripped from their slain mother’s pouch and hit on the head with a water pipe or iron bar until dead; shooters even bash joeys against their vehicle or a tree trunk. Older, ex-pouch, but still dependent joeys, flee in terror when their mothers are killed to die from cold, starvation, predation and maternal deprivation. A million or more joeys die in this way every year. Most shooters will not allow themselves to be filmed killing joeys. The Code of Practice is not linked to the Prevention of Cruelty to Animals Act and is legally unenforceable. The nature and method of slaughter cannot be ignored, it is barbaric and inhumane. Each night thousands of animals are butchered, many are maimed, the pouch young are cruelly dispatched and the young at foot are left to fend for themselves. Any reasonable person would not wish to be a party to this slaughter by purchasing kangaroo products. Former Senator George Georges (Queensland) heard evidence about kangaroo killing for three and a half years as Chairman of the Senate Select Committee on Animal Welfare from December 9th, 1983 to June 5th, 1987. (Preface of “The Kangaroo BETRAYED!). Because headshots are attempted, these may not strike the brain but injure the head including the mouth. These kangaroos escape into the scrub outside the spotlight’s beam and will die over several days from their horrific injuries and starvation. Ex-pouch joeys are still reliant on their mother s milk for protein, warmth in the cold winter’s nights, protection from predators, and they are dependent on their mothers for support. They spend time in and out of the pouch and when their mothers are killed, they are left to fend for themselves, many starve to death. Aside from the cruelty which is inherent in the commercial kangaroo killing industry, one landholder in Western NSW has described ‘pitting’ which is the digging of pits to bury kangaroos that have been killed illegally. These same landholders want to legally increase their income by skin only shooting which is crueller than the carcass trade. They can shoot the kangaroos inhumanely as long as the skin itself is not damaged for the export markets and it is not detected (impossible to police). Skin only shooting is not only more cruel but it is also open to many illegal cases of abuse. The NSW NPWS fought a Court Case in 1996 to stop this trade and won. Now the landholders have friends in political circles who they are lobbying to reopen the skin only trade in NSW. Kangaroos are killed primarily for their leather and skins. Many millions of kangaroos are killed for the shoe leather trade to Italy and the USA. NSW farmers have threatened to use political pressure to get what they want (that is, less kangaroos). The welfare of kangaroos is only paid lip service and is the scapegoat for falling prices and incomes. A Tibooburra, NSW farmer (1999) found over 139 kangaroos dead in his front garden from poisoning (the killing is not policed). NSW landholders want kangaroos to come under the control of the Department of Agriculture and taken away from the NSW National Parks and Wildlife Service and they are using their political clout to ensure kangaroo numbers are reduced to tolerable levels, which may be zero numbers of kangaroos. They use ‘guesstimates’ and changing correction factors to estimate populations. Adidas is far and away the leader in ‘premier’ soccer cleats, with 70 percent of the market worldwide by heavily marketing its highly-priced, kangaroo-skin, ‘Predator’ football boots around the world. Headline stars such as David Beckham encourage the brutality by wearing and promoting Predator boots. It is vital to the survival of kangaroos that we stop the trade of their skins, especially for the manufacturing of soccer cleats. According to Australia’s leading tanners of kangaroo leather ‘Parker Tanning’, manufacturers prefer to use the largest skins to make athletic footwear. These skins come from the large red males who take 10 years to reach alpha status and are being continually massacred only a few survive to pass on their superior genes to the next generation. This means that smaller, weaker and younger males are left to breed with the females, producing offspring who are less likely to survive a major drought or other natural disasters. We must reverse this trend before a major disaster strikes and Australian kangaroos are wiped out! It is frightening that leather suppliers are complaining that there are few large red males left in Australia. Skins are getting smaller and smaller as they now shoot juveniles. Australia has one of the highest rates of extinction in the world but there appears to be no shame, only apathy about this appalling record. Myth: Plagues of kangaroos? Australia overrun by kangaroos? There is a breed of scientist who supports the escalating slaughter and is giving scant attention, if any consideration to the extreme cruelty, inherent in the kangaroo killing industry, except to pay it lip service. They have commissioned the RSPCA to tell us what we already know, that this is a brutally cruel industry which is impossible to police, and leaves behind a million or more dead joeys every year. They are incapable of addressing the fate of the ex-pouch joeys, which are still dependent upon their mothers for survival, escaping to face a lingering death, when their mothers are shot. We are witnessing a carnage of unsustainable proportions for commercial gain. Populations are being reduced to alarming levels in many regions and the species is subjected to ever-increasing kill quotas. The more kangaroos that are killed, the more profits are made and so the cry goes out to kill more and more. Red kangaroos are now being killed at a rate three times higher than they are reproducing. In the 1960’s, their average age was 12; today it is 2. Their average weight was 35 kg in the 1960’s, which today is 18kg. Commercial killing has put insupportable pressure on Red kangaroos which now threatens the species. No animal should be killed in such cruel ways. The Australian Government must bring in laws and monitoring processes to stop this. The public needs to be more informed about this barbaric treatment of animals and also the fact that Australian laws allow it to go on. I couldn’t contain my tears whilst reading this article. Whilst my disappointed in the human race is insignificant to the unbelievable suffering my fellow man bestows upon all natives, perhaps the ever-growing discomfort in my soul could be used for good. Please, what can I do to assist you in your efforts to abolish such barbaric, nonsensical unforgivable behaviour ? Thanks for your email and I apologise for the delayed reply. There are many things you can do to help have a voice for kangaroos. Whilst groups like the AWPC are an important voice, it is imperative that everyone has an individual voice as well. Write to the government at all levels to express your concern. I would write a general email and send it to them all to save time. Local MPs, your local councillors, state government and federal representatives. Write a letter to the editors of newspapers to express your outrage. It is the government who is allowing this to happen to make money. You could also host a screening of the excellent documentary ‘Kangaroo- A Love Hate Story, visit their website for info. https://kangaroothemovie.com/host-a-screening. Getting the word out to everyone is very important and easy to do. All the best and thanks for caring about wildlife!